Annual boosters are required thereafter with the last permissible day being the same date as the previous years vaccination. The first vaccination can be given from 4 – 6 months of age. Horses can not be vaccinated within 7 days prior to a competition. Horses are eligible to compete 7 days after the date of the 2nd vaccination under BHA,FEI and Pony Club rules. Horses competing under FEI rules must be vaccinated within 6 months and 21 days of entry to FEI stables. As previously stated horses can not be vaccinated within 7 days prior to a competition. A primary course of 2 vaccinations given 4 – 8 weeks apart is followed by a vaccination one year later. Boosters are required every other year thereafter. Foals can be vaccinated from 4 months of age. EHV respiratory: A primary course of 2 vaccinations given 4 – 6 weeks apart is followed by boosters every 6 months thereafter. The first vaccination can be given from 5 months of age onwards. 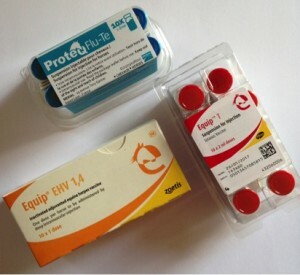 EHV abortion: We recommend that pregnant mares are vaccinated at the 5th, 7th and 9th month of pregnancy.